Certain Landscape Gardening demands will require the use of lawn turf suppliers who can provide good quality lawn or grass turfing to replace an existing lawn which is not responding to conventional treatments or to create a new grass area where none previously existed. 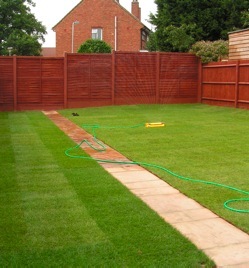 Either way, the importance of using an experienced and creditable lawn turf supplier should not be underestimated. As experienced Lawn Turf Suppliers, Rance Landscapes offers you many decades of experience in supplying and professionally laying high quality turf for a variety of commercial and domestic customers. This means that we can answer you questions and advise what is suitable for your project and offer advice on aftercare. Our supply only service offers you the assurance that we only supply turf that is cut and delivered within 24 hours to ensure that all important freshness. Lay the turf of your choice. Using experienced Lawn Turf Suppliers such as Rance Landscapes gives you the assurance that your lawn turfing project will be properly planned and executed in a professional manner by experts who understand exactly what they are doing. So, you have choice of using Rance Landscapes as a reputable Lawn Turf Supplier or employing us to provide and lay the turf you have chosen.